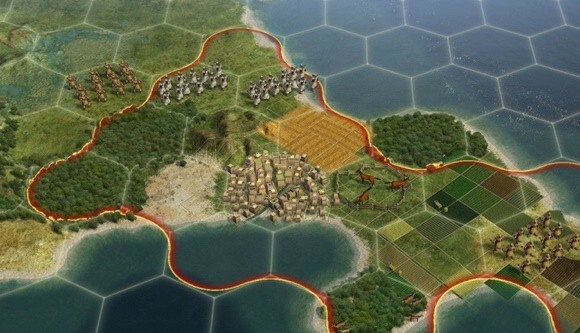 TUAW reports that the latest iteration of the popular PC franchise Civilization, Civilization V, was shown off at the Game Developer’s Conference 2010 this year. There will be a ton of changes to this latest version of this extremely popular PC game as long time fans of the series will notice simply from the UI changes shown in the picture above that shows hexes being used rather than squares for the grid. Now its not all that big news that Civilization will ultimately make its way to the Mac, seeing that all of the past installments of the series have eventually become Mac OS X compatible. However, hopefully we will see it much sooner than later. Though when TUAW questioned developers about it they seemed “noncommittal”, the recent Valve announcement has definitely inspired many developers to start investigating the opportunities for gaming on a Mac. Civilization V will be out for PC in the fall. hex pattern is well known to war simulation strategy games as the ones by Matrix Games and Paradox Interactive. Civ, as a long time series, so it should evolve to something as Supreme Ruler 2020. Previous Entry: Rhapsody iPhone App Allows Downloading of Songs?